Pay Attention to Triggers. Do you notice more intense flashes after spicy foods? Caffeine? Stress? All of these things can cause our blood vessels to dilate, making hot flashes even worse. Try to track your flashes to see if you can pinpoint problematic behaviors. Stay Near the Air Conditioning. Well of course! And if you don’t have AC, an oscillating fan works wonders as well. Dress in Layers. Give yourself the option of peeling off those outer layers when you have to stay cool. Try Controlled Breathing. Taking slow, deep breaths when a flash starts can help decrease severity. Paced respiration helps slow our heart rate and open up those blood vessels. Avoid Harsh Chemicals. Sunscreen includes synthetic estrogens such as oxybenzone and avobenzone which penetrates the skin and further disrupts our hormone system. Look for zinc oxide and titanium oxide instead. Try Acupuncture. Acupuncture increases production of endorphins, which may help stabilixe our body temperature. Exercise. 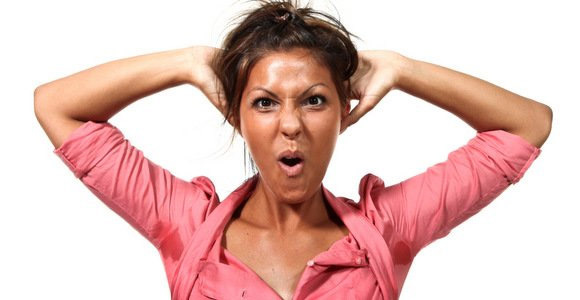 Exercise has been shows to improve hot flashes in some women, provided you finish up more than 3 hours before bedtime. Hormone Testing. Of course, give us a call at 201-255-2525 for a consultation to pinpoint your exact imbalance so we can create a customized plan to help get you feeling comfortable and enjoying the rest of the summer!